This is part of a series of writings exploring plant communities and herbal practice in the Anthropocene….more to come. Walking the urban sidewalks, riparian woodlands, and other forested areas around your home you may have noticed that the effects of globalization are not limited to fashion styles, international trade agreements, and other aspects of human culture. Plant communities are becoming globalized, too. That is to say, many ecosystems now include a mixture of native and non-native species that collectively create a new concept of what wild lands are today. This emerging new feature of landscapes is a defining characteristic of plant communities in the Anthropocene, the proposed current era in which humans are the primary influence on Earth’s systems. While we can agree that this change is undoubtedly taking place, what precisely is happening within these plant communities is not always clear. Arguments continue to be made that non-native plants are both harmful and beneficial to native plant communities. Regardless of how we feel about that, invasive plants bring something valuable to the medicine cabinet. As highly adaptable and opportunistic newcomers, they can sometimes play a remediation role in landscapes with moderate levels of disturbance. With this characteristic, invasive plants may be uniquely qualified to defend us against rapidly evolving pathogens, like drug-resistant flu strains and MRSA, if we allow them to colonize and infiltrate areas of the body struggling with dis-ease. Let’s take a quick look at why our ecological understanding of invasive plants remains unsettled and then see what roles five common non-native tree species can play in their ecosystems and in our apothecaries. For decades, invasive non-native plants such as the infamous Salt Cedar/Tamarisk (Tamarix sp., shown below in flower) and many others have been vilified, poisoned, and scapegoated as the destroyers of ecosystems and the annihilators of biodiversity. In recent years a new perspective has emerged that these plants are, in fact, the saviors of ecosystems that have been severely altered by humans, reinvigorating the health of these systems and increasing biodiversity. How could we change our minds so dramatically and which viewpoint more accurately represents the role of these non-native plants? It would be nice if there was a simple answer but there is not. Every ecosystem and each one of these plants is unique. Furthermore, one species can play different roles in different situations, as invasive plants tend to proliferate in accordance with the degree of ecosystem alteration. We must also consider that ecosystems are continually dynamic. The kinds of changes that are taking place today are new patterns that are still unfolding. They are without historical precedent, which makes it difficult to accurately predict where these changes are taking any given plant community in the long term. Many plant communities of the Anthropocene will experience dramatic changes as new climate conditions accelerate and native and non-native plants co-mingle. Some experts see evidence for increased regional-scale biodiversity (while global diversity declines) as newcomers outnumber extinctions in the plant world and ecosystem fragmentation creates opportunities for new plant taxa to evolve but others warn of the likelihood that invasive plants will continue to expand their range at the expense of natives in the coming decades and centuries. Tamarisk, as one of the most successful and one of the most targeted non-native plants, exemplifies the ongoing debate about the role of invasive plants in regional biodiversity. Some of the accusations, such as the idea that it desiccates floodplains through high levels of evapotranspiration, have been largely debunked. Other assertions including its influence on vegetative biodiversity and impact on wildlife habitat are still debated with evidence pointing in different directions (more on this below). I know it can be difficult to see the changes taking place in the wilds around us, but these plants are here to stay. They are a part of our local plant communities and we can align with the way nature unfolds around us by integrating them into our ecological understandings and into our herbal practice. In looking more deeply at the following non-native invasive trees, we can begin to understand their roles in our wild lands, how we can incorporate them into our medicines, and how our thoughts and opinions about them are evolving. Ecological: Arriving from Asia and southern Europe in the 1800s, Russian Olive (also shown flowering in top photo) has come to fill an ecological niche in the altered environments downstream from dams. It fixes nitrogen in the soil, provides forage for wildlife, and nectar for pollinators. Once established this tree has a tendency to become dominant or co-dominant in the landscape, sometimes forming mono-typic stands. Although the changes in water flow caused by dams are a primary driver in the changing plant communities and the successful establishment of Russian Olive, Russian Olive accelerates human-caused changes by stabilizing soil surfaces and shading out seedlings of native pioneer species such as Cottonwoods that rely on flood disturbance areas for germination and open sunny conditions to grow. It may be considered a thorny protector of damaged ecosystems in some cases, but it may also be a facilitator of change contributing to the reduction in biodiversity by inhibiting the reproduction of keystone native plants in stressed riparian areas. Medicinal: Leaves and stems can be harvested for antimicrobial/antibacterial/antifungal medicinal preparations for wound care or systemic infections. Russian Olive is also used when an anti-inflammatory or muscle-relaxing analgesic is needed. Extracts of this plant have been shown in clinical trials to be as effective as NSAIDS for relief of pain and inflammation but with added gastro-protective properties. Research also suggests that it may optimize blood pressure and have anti-tumor properties. Ecological: Another Asian tree, Siberian Elm is the first tree to leaf-out all over my fair city each spring. The burst of green is followed by the raining-down of confetti as its seeds fill the air and germinate wherever they land, in between concrete cracks or the earthly surfaces of the surrounding natural areas. This tree is known to spread quickly in disturbed areas and will tolerate difficult growing conditions where few others can succeed. Siberian Elm binds heavy metals in soil, providing remediation in polluted urbanized areas and provides early spring nectar for pollinators. Along with Russian Olive and Tamarisk, Siberian Elm is one of the trees expected to redefine the Cottonwood Bosque along the Rio Grande in the coming decades if water management practices remain unaltered. Medicinal: This invasive tree is a very useful and abundant medicine and wild edible. The inner bark can be collected and powdered as a substitute for the threatened and popular medicine of Slippery Elm. It is anti-parasitic, antifungal, antilithic, expectorant, and demulcent. Next time you find Siberian Elm growing through your backyard fence or coming up along a roadway, cut off a small branch, peel off the bark, and feel its soft slippery mucilage inside. Recent research also suggests its potential usefulness in cervical, melanoma, breast, and lymphoma cancer treatments. Gathered in the early spring while still green, the seeds are a nutritious edible and are tasty served raw on top of salads, in sandwiches, and as an edible garnish. Ecological: Probably the least invasive of the trees discussed here (at least in my area), Mulberry is a common yard tree and has also made a home for itself in the riparian corridor. Originating in China, it came to the eastern United States in the 1600s as part of a British effort to establish a silk industry. Although it can form dense thickets in some places, White Mulberry typically does not grow in clusters. 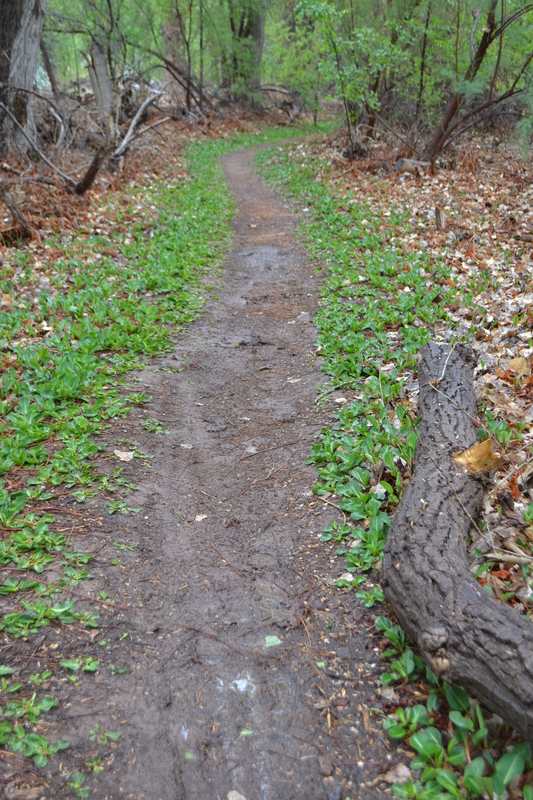 Little information has been published regarding its impacts on native plant communities. Medicinal: Mulberry has a long history of use in Chinese medicine with different parts of the tree being used for different areas in the body. The leaves are antimicrobial, detoxifying, cooling, and moistening to dryness in the upper body, particularly the head, throat, and lungs. The twigs are used to increase circulation in the joints and extremities. The bark is anti-inflammatory and increases the movement of fluids in the lower body and the fruit is a nourishing antioxidant tonic for heart health. Also the fruit is delicious to eat right off the tree. Ecological: Originally from China and Taiwan, this tree is considered by some to be an unstoppable menace sending new shoots up wherever possible. It will grow in a variety of challenging environments including urban areas that are heavily concretized or contaminated and degraded natural areas such as disconnected floodplains in riparian corridors. Growing in such conditions, it can act as a remediator of damaged land and polluted air but its propensity for sending up new shoots could prove to be a problem in ecosystems where there are not sufficient factors to limit its growth. Medicinal: Tree of Heaven can also play a remediation role in the digestive and respiratory systems. It is an antimicrobial, astringent, febrifuge, anthelmintic, antispasmodic, antiseptic, expectorant, clearing heat and dampness in the body. The stems, leaves, and especially the root bark are useful in treatments for diarrhea and digestive ailments caused by microbes and parasites including Giardia. In the respiratory system it reduces inflammation and cleans the airways of mucus and other irritants, facilitating recovery from a variety of ailments. Additionally, Tree of Heaven is soothing to the nervous system and helpful for reducing muscular contractions, shakes, and tremors. Ecological: The poster child for vilified non-native invasive plants since the early 1900s, Tamarisk is the most successful non-native tree in the western United States and has become the third most common woody plant in that region’s riparian corridors. Originating from the Mediterranean and Asia, it has come to symbolize the water struggles of the Southwest by covering well over 600,000 hectares of severely degraded riparian habitat in the Southwest. Numerous bird species use it for shelter including the endangered Western Willow Flycatcher but overall Tamarisk forests support fewer species and fewer individuals than native forests. 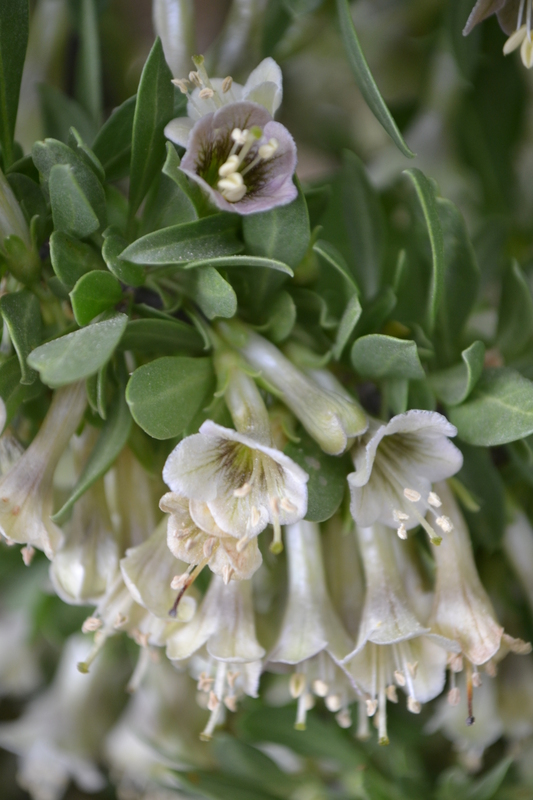 It is an opportunistic reproducer that is tolerant of drought, heat, fires, and saline soils. Similar to Russian Olive, it stabilizes surface soils inhibiting the germination of native riparian trees and shades out native tree seedlings. It can grow in vast mono-typic stands forming dense thickets, changing soil composition, and greatly reducing the beneficial mycorrhizal community that facilitates native plant growth. Like Russian Olive, Tamarisk finds a habitat niche in degraded riparian ecosystems with altered flow regimes and contributes to the process of change initiated by human interference. This tree may be considered a willing colonizer of damaged ecosystems where natives are in decline but it can also play a role in inhibiting the growth of native plants and further reducing biodiversity. Medicinal: The bark and galls are harvested and used for topical application or small internal doses. It is an effective antimicrobial, antioxidant, diaphoretic, diuretic, astringent, and detoxifier that is used to make first aid wound washes or mouthwash. Internally it can be included in formulas for detoxification, microbial diarrhea, and other infections. The information included in this essay was later expanded and published as: Saville, Dara. (2018). Invasive Plant Medicine and Ecology. Plant Healer Quarterly, 8(3), 104-112. Crawford, Clifford S., Lisa M. Ellis, and Manuel C. Mulles Jr., 1996. The Middle Rio Grande Bosque: an endangered ecosystem, New Mexico Journal of Science 36: 276-299. DiTomaso, Joseph M. 1998. Impact, biology, and ecology of salt cedar (Tamarix) in the Southwestern United States. Weed Technology 12 (2): 326-336. Evans, Alexander M. 2014. Invasive plants, insects, and diseases in the forests of the Anthropocene. U.S. Department of Agriculture, Forest Service, Santa Fe: NM. Folstad Shah, J. J., M. J. Harner, T. M. Tibbets. 2010. Elaeagnus angustifolia elevates soil inorganic nitrogen pools in riparian ecosystems. Ecosystems 13 (1): 46-61. Friedman, Jonathan M., Gregor T. Auble, Patrick B. Shafroth, Michael F. Merigliano, Michael D. Freehling, Eleanor R. Griffin. 2005. Dominance of non-native riparian trees in western USA. Biological Invasions 7 (4): 747-751. Glenn Edward, Pamela Nagler. 2005. Comparative ecophysiology of Tamarix ramosissima and native trees in western US riparian zones. Journal of Arid Environments 61 (3): 419-446. Johnson, W. C. 2002. Riparian vegetation diversity along regulated rivers: contribution of novel and relict habitats. Freshwater Biology, 47: 749–759. Kane, Charles. 2011. Medicinal Plants of the American Southwest. Lincoln Town Press. Katz, Gabrielle L., Patrick B. Shafroth. 2003. Biology, ecology, and management of Elaeagnus angustifolia L. (Russian olive) in western North America. Wetlands 23 (4): 763-777. Pearce, Fred. 2015. The New Wild. Beacon Press: Boston MA. Scott, Timothy Lee. 2010. Invasive Plant Medicine. Healing Arts Press: Rochester VT.
Sogge, Mark K., Susan J. Sferra, Eben H. Paxton. 2008. Tamarix as habitat for birds: implications for riparian restoration in the Southwestern United States. Restoration Ecology 16 (1): 146-154. Shafroth, Patrick B. James R. Cleverly, Tom L. Dudley, John P. Taylor Charles Van Riper III, Edwin P. Weeks. 2005. Control of Tamarix in the western United States: implications for water salvage, wildlife use, and riparian restoration. Environmental Management 35 (3): 231-246. Sher, Anna, Martin F. Quigley. 2013. Introduction to the paradox plant. Tamarix: A Case Study of Ecological Change in the American West. Oxford University Press. Tehranizadeh, Zeinab Amiri, Ali Baratian, Hossein Hosseinzadeh. 2016. Russian olive (Elaeagnus angustifolia) as herbal healer. BioImpacts 6 (3): 155-167. Thomas, C. D. 2013. Local diversity stays about the same, region diversity increases, and global diversity declines. Proceedings of the National Academy of Sciences of the United States of America 110 (48): 19187-19188. Thomas, C. D. 2015. Rapid acceleration of plant speciation during the Anthropocene. Trends in Ecology and Evolution 30 (8): 448-455. Velland, Mark, Lander Baeten, Isla H. Myers-Smith, Sarah C. Elmendorf, Robin Beausejour, Carissa D. Brown, Pieter De Frenne, Kris Verheyen, Sona Wipf. 2013. Global meta-analysis reveals no net change in local-scale plant diversity over time. Proceedings of the National Academy of Sciences of the United States of America 110 (48): 19456-19459. This entry was posted in anthropocene, Bosque, foraging, herbal medicine, herbalism, herbs, invasive plant ecology, invasive plants, invasive trees, non-native plants, wild food and tagged Ailanthus altissima, anthropocene, ecology, Elaeagnus angustifolia, herbal medicine, herbal remedies, herbalism, herbs, invasive species, invasive trees, Morus alba, Mulberry, non-native plants, Rio Grande, Russian Olive, Salt Cedar, Siberian Elm, Tamarisk, Tamarix, Tree of Heaven, Ulmus pumila, weeds, wild food on December 27, 2016 by darasaville. 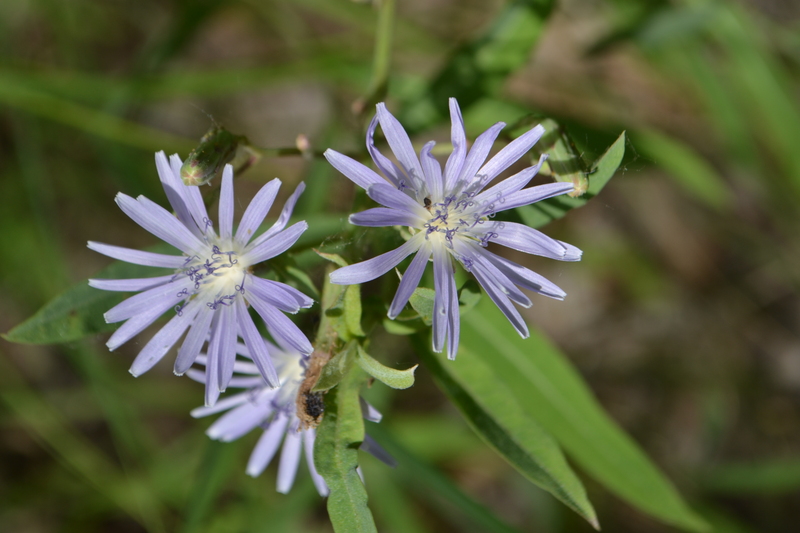 Blue Lettuce (Mulgedium pulchellum or Lactuca tatarica var. pulchella): Blue Lettuce is a native sister of the more common non-native weed Lactuca serriola, or Wild Lettuce, and is present across much of North America. Both share many common attributes including bleeding a milky sap with medicinal properties. This sap is captured in fresh herb tinctures made from all parts of the plant (especially leaves, and stems) and used as part of formulas for promoting restful sleep, calming bodily spasms, relaxing tension and anxiety, coughing, and even acts as a mild pain reliever. Additionally Blue Lettuce is a tasty wild green when collected early in the spring. Pale Wolfberry (Lycium pallidum): This powerful member of the Solanacaea family is a medicinal shrub related to the more famous Goji berry. Wolfberry, however, should be used in moderation and works well in formulas where the dosage will be smaller. Too much of this plant can create imbalance, dryness, and heat—exactly what we don’t need here in the Southwest. It combines well with other herbs that get at the root causes of illness while Wolfberry eases symptoms. Collect the leaves for tincturing or keep some stored dry to reconstitute for topical applications. The latter comes in handy for the pain and swelling that often comes with summertime’s bites, stings, and rashes. In that case, you can mix the powdered herb with some clay and water or just water to make a nice soothing paste. Wolfberry also works in the respiratory system by opening chest congestion and drying the wetness of allergies. It is also an effective anti-spasmodic in the digestive system. 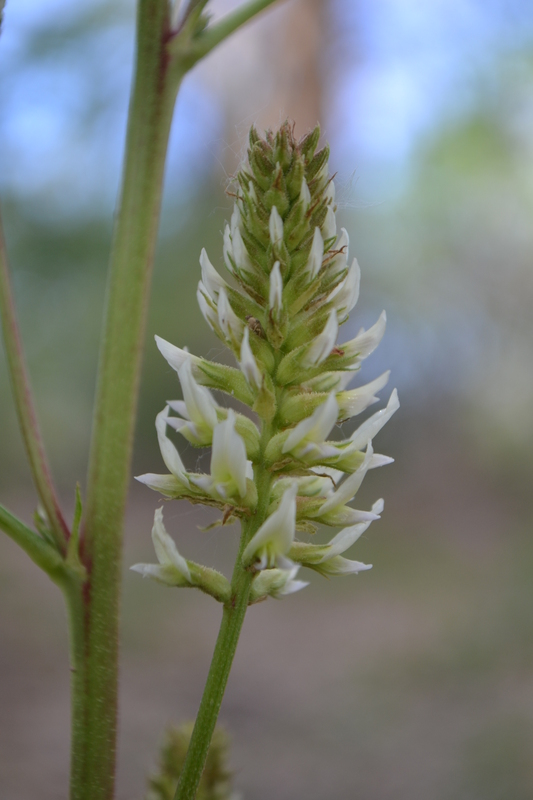 American Licorice (Glycyrrhiza lepidota): Our native Licorice is a frequent find when walking through the Bosque or along Albuquerque’s acequia system (irrigation ditches that carry water throughout the valley). Often this plant grows in compacted soils, which makes digging the roots a difficult chore. Unlike other species of Licorice, ours contains little glycyrrhizin and lacks the super-sweet flavor that typifies this plant. This may be a benefit for those who do not care for the flavor of purchased varieties of Licorice or for those who have contraindications to using this plant. (Usual contraindications include high blood pressure, edema, and diabetes.) Licorice has been used for centuries (or longer) for the treatment of a long list of health conditions including all kinds of inflammations and viral infections, especially coughs and sore throats. Like other members of the Legume family, Licorice has an important ecological role to play though its symbiotic relationship with soil bacteria and by fixing nitrogen in the soil. Canadian Fleabane (Conyza canadensis): I did not intend to discuss weed species in this post, but I could not resist including this abundant and useful native that is so widespread in the Bosque as well as other areas across the entire continent. The upper leaves of this plant make useful digestive remedies, especially for chronic inflammatory issues, leaky gut, diarrhea, and indigestion. This plant has a unique spicy flavor and can be used to create interesting culinary creations in your kitchen. One of my favorite ways to prepare it is to infuse the leaves in oil or vinegar and use it for medicinal foods, salad dressings, and marinades. Japanese Honeysuckle (Lonicera japonica): It seems that every environment in this modern global era must be defined, in part, by the invasive non-natives. That’s why I am including one of them here for the Bosque and believe me there are many to choose from. Besides we can do the ecosystem a favor by harvesting the invaders’ flowers. 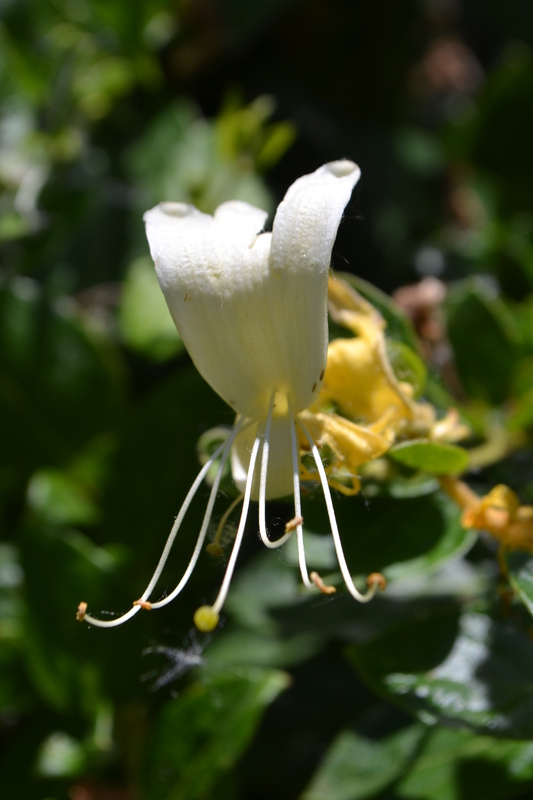 Honeysuckle flowers are cooling for hot inflamed conditions and provide antibacterial and antiviral power. Prepare as tincture, tea, glycerite, or infused honey. By Dara Saville, July 2015. Continue on this topic with my featured photography and writing: Visions and Voices of the Bosque. Jean-Luc E. Cartron, David C. Lightfoot, Jane E. Mygatt, Sandra L. Brantley, and Timothy K. Lowry, A Field Guide to the Plants and Animals of the Middle Rio Grande Bosque, (Albuquerque: University of New Mexico Press, 2008). Michael Moore, Medicinal Plants of the Mountain West, (Santa Fe NM: Museum of New Mexico Press, 2003). William Dunmire and Gail Tierney. Wild Plants of the Pueblo Province (Santa Fe NM: Museum of New Mexico Press, 1995). Look for more on this topic in a future issue of Plant Healer Quarterly. 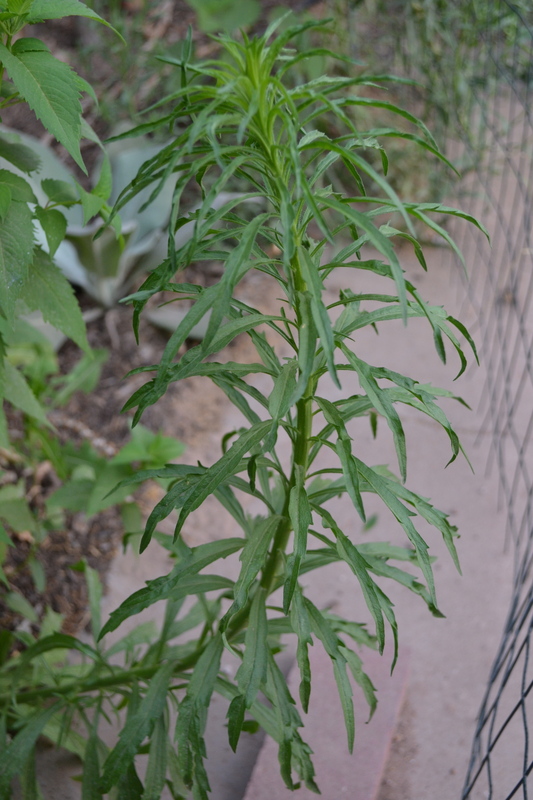 This entry was posted in Bosque, herbal medicine, herbalism, herbs, native plants and tagged Bosque, Candian Fleabane, herbal medicine, herbs, Honeysuckle, invasive species, Lettuce, Licorice, native plants, Rio Grande, weeds, Wolfberry on July 10, 2015 by darasaville.